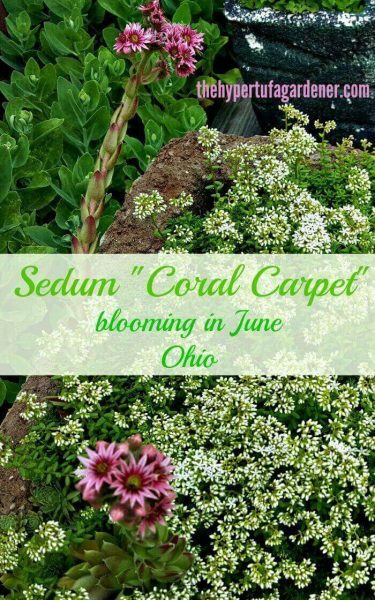 Sedum Coral Carpet is a perfect sedum for hypertufa pots and containers. This tiny sedum is mat-forming and has new growth that is salmon-orange (hence the name coral), grows to bright green and can turn reddish-bronze in winter or when it is stressed. 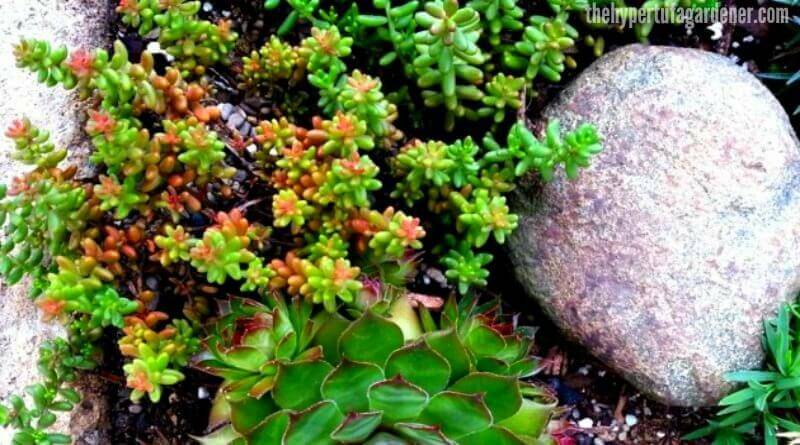 Like most sedum and succulents, the most beautiful colors occur when stressed, which can occur from heat or cold. 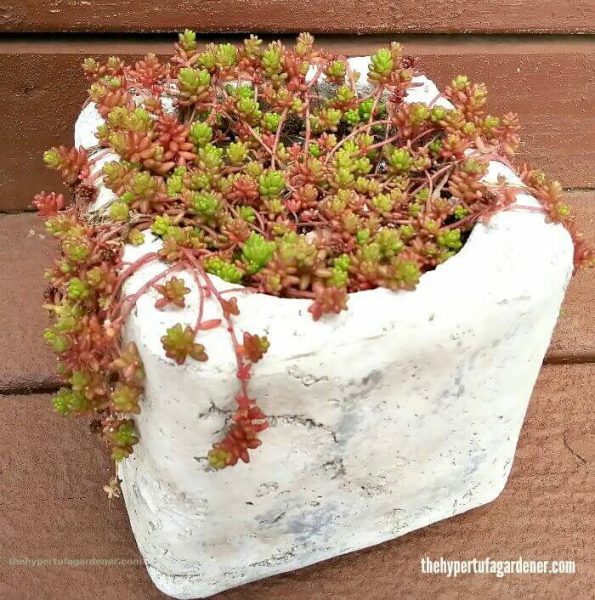 I have this sedum in several of my hypertufa pots and it does really well. It has grown so big this year that it is overtaking the large T Rex trough along with the Sedum sexangulare which I wrote about here. Clusters of tiny white to pale pink flowers appear above the foliage in early summer. This is the 6″ height in the description. Otherwise, it just hugs the soil, looking like tiny beads. 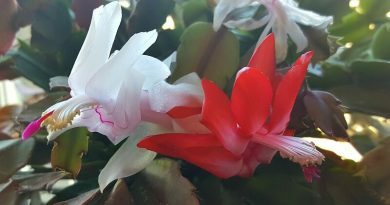 In past years, the plant was just beginning in my troughs, but these last few years have shown so much growth and spread. 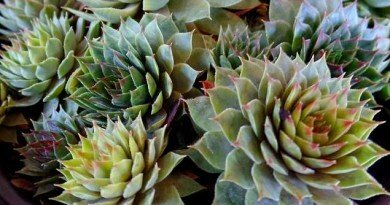 Sedum comes from the Latin word “sedo” meaning to sit in reference to the general growing habit of sedums (sit and sprawl over rocks). 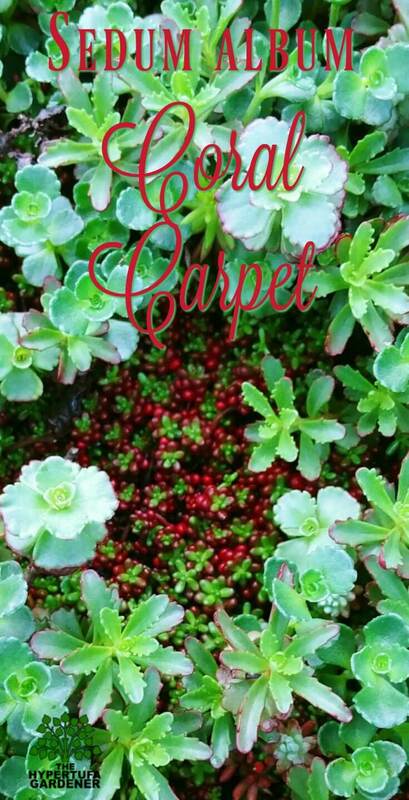 This Sedum “Coral Carpet” is a little carpet-like plant and works perfectly for draping over the edge of a container. It just dangles and tries to find a rooting spot. So it is very easy to propagate. Just stick a cutting into soil and off it goes. I have some sprouting in areas of my gravel paths where I have dropped a cutting. It is an option for paving areas, since it can be walked on. But I would put it at the edge of a path. I just can’t step on a plant if I can help it. 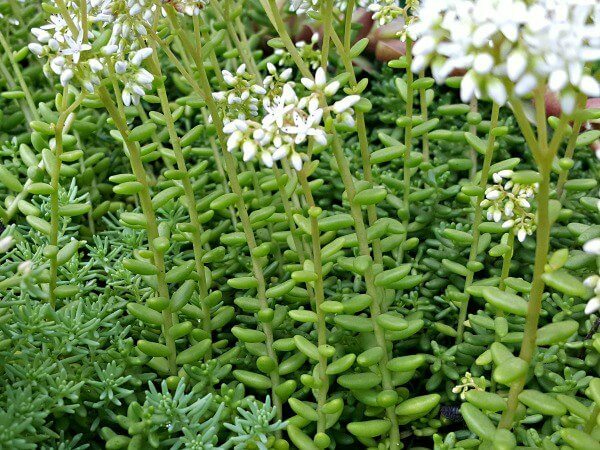 This tiny beady low-growing plant is perfect for green roof plantings, or vertical wall projects. Try it for your fairy gardens, or even a miniature railway garden. This year, you can see how much the sedum has grown. It has formed a huge cloud of flower and foliage in my largest trough. Check out that overview and believe me, the bees were enjoying the flowers. Here is another photo from “underneath” the foliage. The small branches stretch up and blossom at the end of the branch. I tried to maneuver up under the mat of growth to get this one. 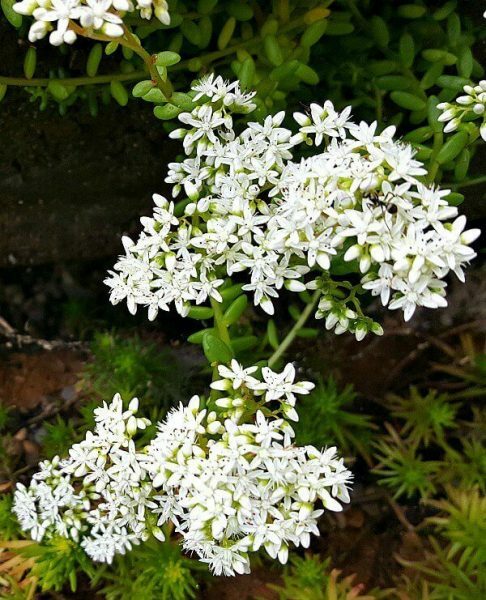 My sedum has always stretched upwards as it begins to bloom and I will trim back after the bloom. That is a little bit of Sedum hispanicum at the bottom left. They are growing together and seeming to get along. 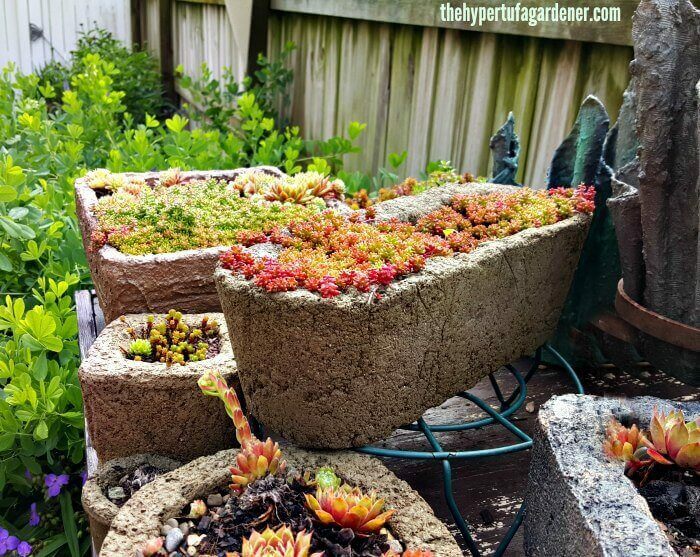 Here is the sedum spilling over the sides of the hypertufa trough. I think the Sedum Coral Carpet likes its home, but I will need to replant some of it since it seems to be outgrowing the planter. After the bloom, I will trim all the longer stalks with shears. It needs to be trimmed back to keep its compact growth habit. 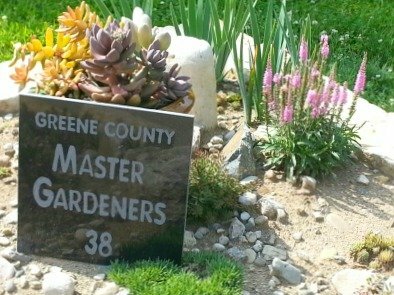 Have you grown this sedum? Why not add it to your list. It will become a favorite. Til next time, keeping growing!